From out of nowhere something slammed my PK spoon and it was instantly clear it was a Northern Pike. I was using the same uglystick light action rod with 2lb mono and it went for one hell of a run, each time I would gain line back only to have it run again. 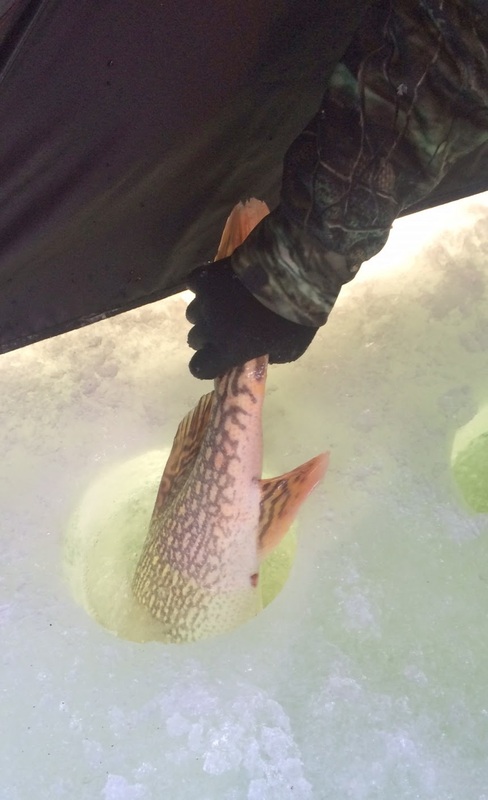 Experiencing a few handfuls of pike fights on Ultra light or light gear this winter (while targeting perch), I was able to keep my heart rate under control and the shakes down ... until we saw its head at the bottom of the eight inch hole. After a few more runs and retrieves, it just hung out at the bottom of the ice , looking up. With a bit of slack given and a tug on the line by Jay we were able to get it up the hole and onto the ice for some measurements and pictures. I know they get way bigger than this, but this was on a pressured body of water in the southern division. I caught a 37.5 incher last season on the Red River in December but this one was clearly ALOT heavier. We got it back in the hole and after a few seconds it swam back down. 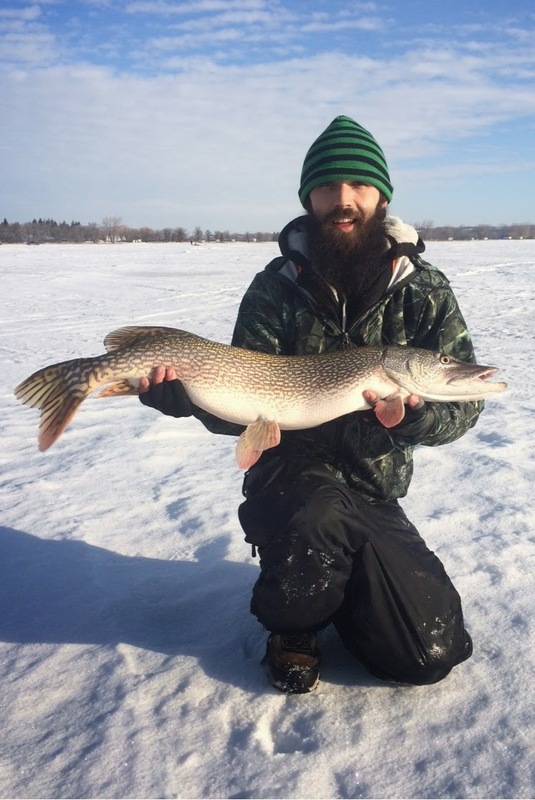 A roughly twenty pound, 38 inch northern pike on 2lb mono, we were all ecstatic!! We were constantly keeping an eye on the tip ups and after about two hours we got our first flag, Jay ran over and set the hook but some how it wasn't a clean hook set, and the weight was gone. We reset the flag and bait and waited it out for the next one. 45 minutes and a dozen perch later the flag popped again, I ran over and set the hook, feeling good weight below and then the fish realized what was up. It peeled off on a run and we had to feed out a few meters of line. Hand over hand retrieve and once close to the hole it went on one more good run. After that it was smooth sailing and up came a 30 inch northern. My first fish on a tip up in a long time, man I miss that style of fishing and won't wait so long again for the next time. Our third flag went to Jay again, he was really pumped having never fished this way before. We had a nice big dead bait on the rig and we knew what ever hit it would be a good one. 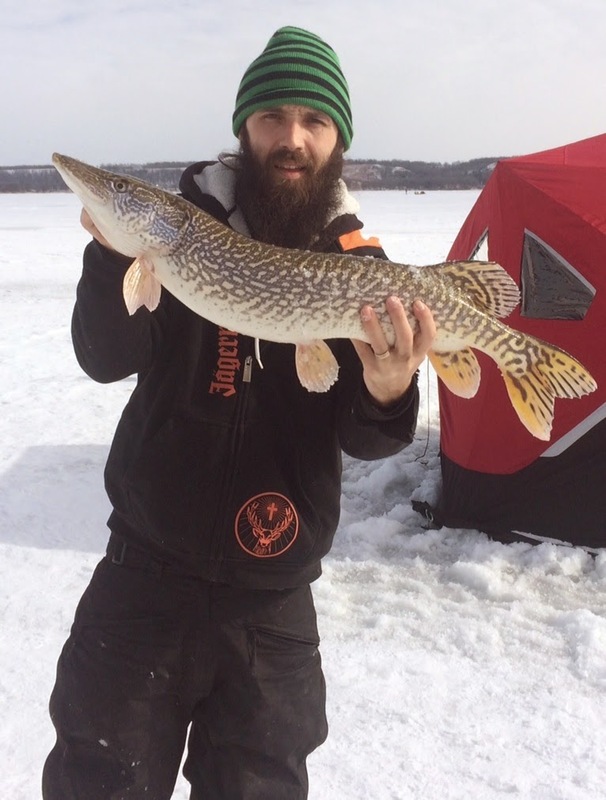 After setting the hook and a brief fight the line cut on the bottom of the ice. A total disappointment, looks like its time to replace the tip up line. Later in the day with the action slowed right down, I noticed a mark cruising up high and coincidentally had my Pk spoon still on that rod. I ripped up 16 inches past it and it hammered the lure on the drop, tearing off on a solid run. My two fishing partners were half a kilometer away from the shack at this point, so there was no assistance on this one and after three heart racing runs it bit through the line and was gone. That's the price you pay and the risk you take with light line.